Last edited by Chad; 10-15-18 at 07:12 PM. Good choice for the theme. Nice VHS 80s junk food schlock. Nothing great, but better than I expected. I love the trunk bit where they're semi-joking about a psycho killer hiding and there's a dead body. I can't decide if it's annoying that not much happens with the killers until later in the film or if that helps things from going over the top and relishes in suspense. I'm leaning towards feeling like it nicely teases with underdeveloped killers and a sense of 'what will come next.' Once things get going with the girl crashing through the roof door it really picks up... It's sly humor that (one of the) killers is such a cleanly dressed sweater wearing apparently average guy especially considering all the other 'cabin in the woods' 'rainy night' tropes in play. 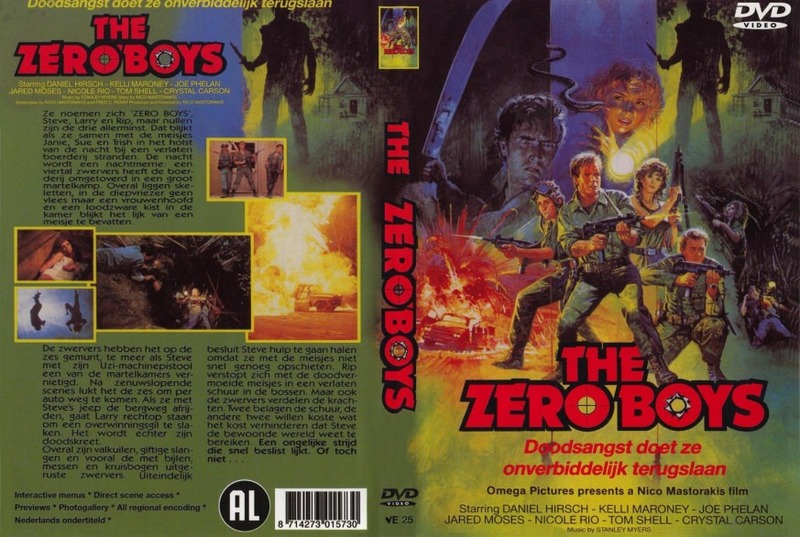 Zero Boys is surprisingly 'meta' for 1986, ahead of it's time. I love the ending of there being another one lurking in the tree. Could Rip's white spot be any more distracting? Slightly opposite for me. I thought it was well-paced prior to that and things began to drag when they got seperated in the woods. For me, at least. Oh and plenty of horror fans would have recognized the familiar sets (Jason's stomping grounds in Part 3! Adding to the meta, he gets name-checked here) they still looked real nice then. Too bad the house got burned down, but the barn is still standing. I watched this movie for the first time a couple months ago. I was surprised to find an 80's slasher movie that I had never heard about. About 30 minute into it, I stopped the movie and checked the release date on IMDB. It felt like a modern day parody of 80's action/slasher movies. It was such a perfect mix of cheesy 80's storyline, characters, humor, fashion, music, etc. And using the same locations from Friday The 13th Part 3 really convinced me this was just a modern spoof. I didn't know the house had burnt down, until I looked into the filming locations. With the pacing I think it's interesting that the 'heroes' are the ones who are trigger happy and fully stocked with weapons while the villains mostly keep to the shadows with scare tactics and knives; it's hardly even a fair fight. 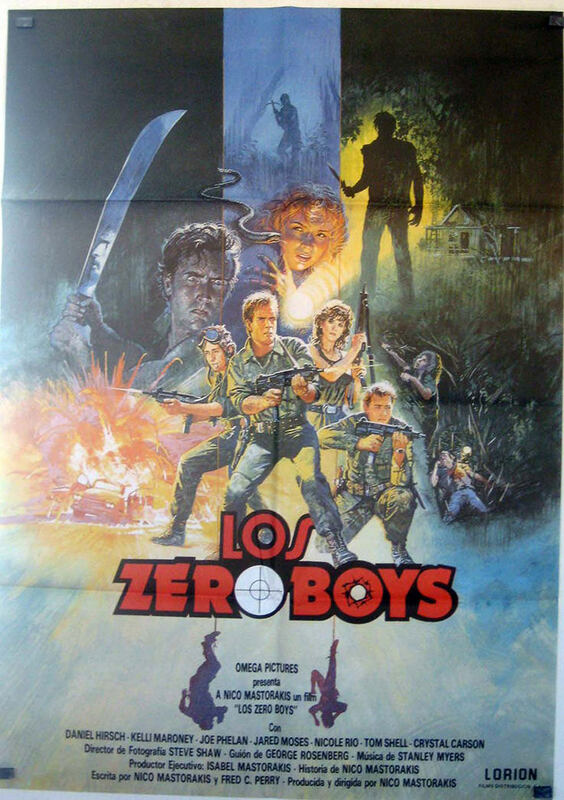 I think this is something that adds to the feeling of parody, that the Zero Boys are more of a shoot em up crew but the killers are practically ghosts - if not for their comedic/fun zest for life it might be easy to think of the Zero Boys as being sociopaths (armed to tilt, crashing in someone else's house) further blurring the line. Zero Boys did not do much for me. I think if i had seen it in the 80s ( I was twenty-one when it came out) I might feel more nostalgia for it, but as it is, i just thought it was a silly, dumb down "Most Dangerous Game" story. This was my response too. The cast all felt subpar to me. And there were some script issues. The main guy keeps insisting they don't split up, but then he leaves behind the girl to tie her shoe. Um-hmm. I agree that the villains were more ghosts than real characters. And they were so inconsistent. Initially with the recording videos and mind games they seemed much smarter, but then when they appear they look like inbred hicks. I liked the general premise of a group of guys who like to play war running into some seriously bad dudes. I really thought this for the first 20 minutes, but it never really payed off for me. I really needed a palate cleanser, as Heredity's been sticking with me. I wanted to like this one more than I did. At first I thought there was something wrong with my copy because it seemed to start right in the middle of movie. There was this big paintball shootout with characters I didn't know. I think it went on a bit too long because the punchline was kind of obvious, why else would they be wearing such goofy costumes? And I'm a big fan of 80s slashers, even if they're terrible or cheesy whatever. Reading through everyone's comments, it feels like those elements should have worked for me, they just didn't. I honestly feel like I was still thinking about Hereditary too much. It stuck with me all day yesterday, and I feel like any subset pick following it would've felt underwhelming to me. I almost wish Hereditary had come later in the month because it set the bar impossibly high.